David Starkey is to produce a four-part “psychological profile” of Henry VIII for Channel 4. The as-yet-untitled series will go beyond the facts of Henry’s six wives and his split with the Catholic church to piece together a sense of his character and motivations. Soundtrack available here. The series will be broadcast in April, to coincide with the 500th anniversary of Henry VIII’s accession to the throne and a major British Library exhibition on the monarch. The soundtrack has been composed by Philip Sheppard and is based on music written by Henry himself, as well as themes drawn from Tudor contemporary composers such as Philippe Verdelot and Robert Fayrfax. The score is being performed by Philip Sheppard, together with the superb vocal consort Alamire (directed by Dr David Skinner) and viol consort Fretwork. The first 60-minute episode will show Henry as a highly intelligent child, while subsequent episodes will paint him as a brilliant “A-list celebrity” character with an over-developed ego and “solipsistic sense of self”. Indeed, the Daily Mail has just run a story, resulting from one of Starkey’s more surprising discoveries; Henry’s possible use of a stairlift towards the end of his life. Nice work sir. I rather like Starkey’s stuff too, he finds humour in history, always a good thing. 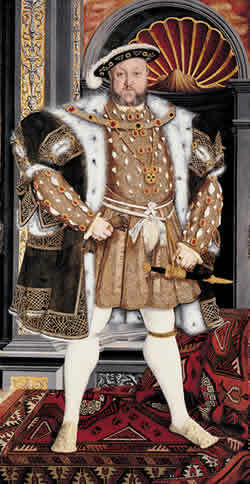 I actually went to a school founded by Henry VIII as it happens…well, the originl was at least. I love David Starkey’s history programs. Your music will be the icing on the cake for the program, it is truly beautiful. I was fascinated by the entire tv program not only it was an eye opener regarding the entire personnality of Henry the v111 but also it brought up to the forefront the role and influence of forebearers and the realisation that some of “Henry trade marks”also exists in our current political systemr”set up”s. .and conflicts .
. I would very much appreciate to be recommeded a book by David Starkey to widen my horizon on his very interesting research before it is too late. Great to hear from you. I’ve forwarded this to David Starkey’s own website as I’m just the composer for the series – but I would recommend Henry the Virtuous Prince by David Starkey. He’s also (shortly) bringing out a book on the latter half of Henry’s reign too.